AP Environmental Science students recently planned projects with two goals: involvement of the community and the benefit of the local environment. Some students took the direct approach and organized tree and flower plantings, river clean-ups, and structure building for efficiency and wildlife. We are creating an aquaponic greenhouse in an ongoing project, and we now also have an extensive butterfly garden, functional and beautiful birdhouses, and new trees on campus. Our section of Goose Creek is litter-free and more friendly to wildlife than ever. Next time you pay us a visit, keep an eye out for deer, turkeys, salamanders, groundhogs, foxes, and more! Other students focused on an indirect approach, using workshops and education in advocating for a healthier environment. There was a tie-dye event for the Chesapeake Bay Foundation, a workshop on sea turtles that included an emphasis on reusable utensils (such as metal straws) as well as a letter-writing campaign to government officials, education on paper water bottles, and a focus group on restoring the food supply of assorted endangered species. All of the individual projects were planned by students and organized to use the student body as their workforce: every single Middleburg Academy student contributed in some form, with all of them showing incredible motivation and increased interest in the local environment. Axel Arellano admits he never saw it coming. But Middleburg Academy Head of School Colley Bell said he never had any doubts when he and the outgoing Prefects made the final choice to select the senior to fill one of the most important student leadership positions on campus. Arellano is the head prefect this academic year, leading a group of four outstanding students selected for those roles by the faculty, their peers and ultimately Bell. His prefect colleagues are fellow seniors David Penney, Lana Bennett and Coco Chen. According to Kasey Morris, the school's admissions officer, "prefects embody the highest level of student leadership at Middleburg Academy. They oversee all aspects of student leadership and work with the faculty and administration to ensure that the school's motto - Learn. Lead, and Serve. - is successfully engaged." The Prefect program began five years ago in Bell's second year. It's based on a system set up by Thomas Arnold, a leading 19th century education reformer at England's Rugby School. Arnold once described Rugby as having a prevailing atmosphere of "anarchy tempered by despotism." He tried to instill an ethos of honor, moral values and personal commitment and wanted prefects to set an example for younger pupils. Bell and his wife, Edwina, also a school administrator, both had been advisers to Arellano and said they saw in him all the qualities of the perfect prefect. He was an outstanding student, a dedicated athlete and seemed to gain the respect of the faculty and fellow students with every passing year. "He was the whole package," Edwina Bell said. "We could see it in the way he carried himself and the respect he got from the other students. We don’t have locks on the lockers. We don’t have issues with bullying. Our younger students know that's not acceptable because they see the example set by our student leaders." The prefects meet twice a week to discuss various issues. They make recommendations on the student code of conduct. They're encouraged to tell Bell when a rule or a program doesn't seem to be working. They run school meetings, work with student council officers and always try to make themselves available, particularly to younger students who may not be familiar with the school's culture. They most definitely are not meant to be "tattletales,” the prying eyes and ears of teachers and administrators. Just as an example, if Axel sees something on social media that's not appropriate, he'll tell that student 'hey, knock that off.'" Colley Bell said. "He doesn't have to report back to me. He doesn't have to drag that student into the office." Arellano himself is rather soft spoken and unassuming. Colley Bell knew he was a quiet type when he had him his history class as a junior. But he also notices that the senior prefects also seemed to gravitate toward him. Arellano hopes to attend Virginia Tech to study engineering, and the prefect program surely will be a feather in his cap. For now though, he’s focused in his responsibility at Middleburg Academy. Every morning, while students and teachers are entering our main academic building, moving from lockers to classrooms with books and coffees in hand, greeting one another and getting settled, piano music fills the air. These are Mornings at Middleburg. 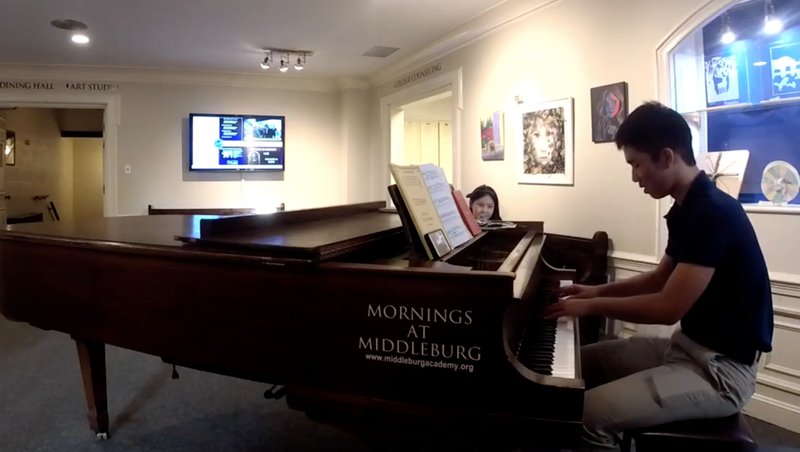 Mornings at Middleburg started when one of our international students from China simply played the piano for the love of it each morning. Soon, it became a daily occurrence, with our community looking forward to it every day as a positive and energizing way to start things off. In short order, Head of School Colley Bell decided to livestream the informal performances so that everyone, including the student’s parents far away in China, could tune in; for this family, it was an opportunity to see their child from afar, often as they sat down to dinner while she just began her day in the United States. Now, Mornings at Middleburg are open to any student who would like to perform for the community, setting the vibe for our day. We invite you to us for Mornings at Middleburg. In the photo: Alex Hess and another student competitor with Brayden Simpson, Affiliated Teaching Artist with the Shakespeare Theatre Company and graduate of NYU's Tisch School of the Arts, where Alex is headed next year. 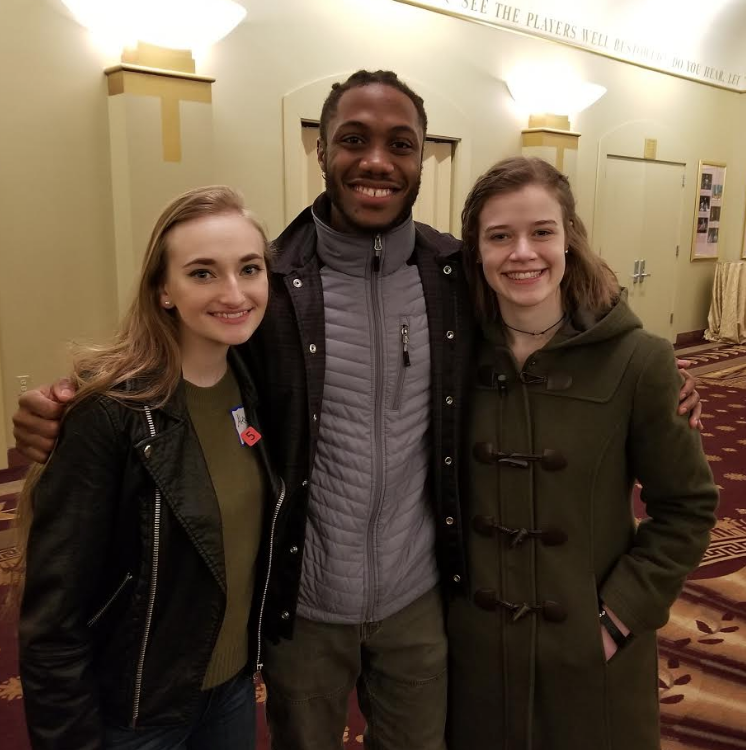 On Monday, March 19th, students and teachers from across the Washington DC metro area gathered at the The Lansburgh Theatre, home of the Shakespeare Theatre Company (STC) in downtown DC, to compete in the 29th Annual National Shakespeare Competition. Representing Middleburg Academy, senior Alexandra (Alex) Hess performed Hamlet's famous "To be or not be..." soliloquy and Shakespearean Sonnet 43. Student competitors presented their pieces to a panel of three judges of local theatre professionals including the Director of Education at STC. The students also participated in a Shakespearean Monologue Workshop and a Q&A session with a group of three professional actors affiliated with STC. Middleburg Academy's Drama Teacher, David Sturdevant, attended the event and commented, "This was a tremendous event for all the of the competitors. Alex did an amazing job representing the school and made some great connections with other students and professionals. So many teachers expressed to me what an outstanding job she did." While not selected as a finalist for the national finals, Alex was pleased with the experience. "It was an honor to present on this stage where so many great Shakespearean actors have performed. I learned a lot and made some great friends. I hope the school will continue to participate in the future." Middleburg Academy was pleased to host the Middleburg Hunt on our beautiful 90-acre campus on Thursday, November 16th. Below, in front of our historic Mary House, huntsman Richard Roberts speaks with students about the tradition of foxhunting in Virginia. Students served apple cider to the mounted riders, as the hounds mingled and made new friends. Joining the action for the day were: Salem Twiggs ('20) and her father, MFHA Executive Director David Twiggs; sisters Beverly ('20) and Nancy ('18) Alcock with their dad Graham; Robin Peterson ('18); Sophie Horn ('18); equestrian coach Jennifer Lee; and faculty member Kasey Morris. Earlier this fall, Middleburg Academy Head of School Colley Bell wanted to see for himself exactly what all the student buzz was about when he decided to walk over to the cam­pus's latest innovative "classroom." He'd heard many of them anima­tedly chattering about the experience they'd had working with art instructor Stephen Rueckert on one of two forges set up in a large converted storage area. Rueckert was teaching his charges how to manipulate a glowing hunk of metal that had been heated to 1,500 red--hot degrees on one of two forges-one coal-fired, the other fu­eled by propane. The students would learn how to bend it, twist it and eventually shape it into something that might even be used on another building project at the school. "The kids were all talking about it," Bell said. "And after I tried it my­self, I knew why. When you feel that metal bend, something really hap­pens to you. It's quite amazing. Now all the students want to try it. They want to start a forge club." Rueckert, now in his second year on the Middleburg Academy faculty, learned how to use a forge many years ago when he was a student at the Rhode Island School of Design. He spent his first 20 years after college as a full-time artist living in Brooklyn before he went back to school at age 40 to earn a Masters of Fine Arts de­gree from Brooklyn College. A widely-acclaimed sculptor, his work can be found in the permanent collection of Metropolitan Museum of Art in New York and The Brook­lyn Museum and has been featured in publications such as Art Forum, the New York Times, Washington Post and The New Scientist. New York City school system before moving south, where he taught at St. Albans in Washington before chang­ing venues to Middleburg Academy. He was brought on board to help Bell and other faculty members figure out a way to boost the school's STEM programs (science, technology, engi­neering and math) with a healthy infusion of the arts and humanities. Make that STEAM, with an equal emphasis on the A, as in arts. The school also is implementing another acronym - MOCHA - which stands for Make One Con­nection Happen-Arts, Academics, and Athletics. The primary goal, ac­cording to the school's description of the program, "is to encourage every teacher to reach out across the cur­riculum to partner, collaborate and make at last one teaching connection happen every semester." Rueckert is heavily involved in helping to coordinate that effort, and he's also a firm believer in employ­ing a hands-on approach to his own teaching. "If you're going to be an engineer," Rueckert said, "you should know what it takes to bend a piece of steel. It helps you understand how things get made. Many engineering schools are getting the bright kids., but many of them don't have that hands-on ex­perience, which to me would seem to be so important." There's also another useful benefit to the forge work, along with other practical skills Smith is teaching his students, including welding and glass making. Middleburg Academy is embark­ing on a project to restore a stable complex built in 1910 that hasn't been used in years and nearly had its roof collapse in a major hail storm in May, 2016. Students will be using the forg­es to make replicas of original handles on the stable doors, and they're learn­ing basic woodworking and how to etch glass windows that also will be used in the stable renovation. The stable's eventual residents­horses-will also be part of the first S in STEAM, as in the science cur­riculum. "To me, it's all about the balance between science and the humani­ties," he said. "It's a collaboration across the whole curriculum-Latin and and science, math and science, art and engineering. There are just so many possibilities. You want to show them how to use the tools and use their imaginations. 'Il1at's my joy-getting them to use their cre­ativity and their imagination." An exciting new effort is underway to reinforce our S.T.E.A.M. program and energize interdisciplinary teaching and learning at Middleburg Academy. We call it ONE CONNECTION, or MOCHA for short. Our primary goal is to encourage every teacher in the school to reach out across the curriculum to partner, collaborate and make at least one teaching connection happen each semester. It is our way to keep ideas fresh, new, exciting, interactive and applied for both faculty and students. All aboard! No stone left unturned. Leonardo DaVinci approved! Middleburg, VA (Feb. 28, 2017) – For the first time in Middleburg Academy history, Fencing is a winter varsity sport. A sport of grace, speed, and reflexes, fencing is a sport in which two competitors fight using swords with dull tips, winning points by making contact with their opponent. Middleburg Academy fencers were extremely grateful to have had two outstanding coaches this season in Rolando Tucker, a former Olympian and World Champion from Cuba and Turner Smith, a former Ivy League fencer, from Princeton, and who has been featured in publications such as Middleburg Life. Coach Turner Smith, a retired environmental attorney, now devotes much of his time to Virginia land conservation. Smith, the athlete, returned to the sport five years ago, at age 70 and almost 50 years after he competed as a varsity fencer at Princeton. Smith decided not only did he want to take up the demanding sport once again, but also to coach. Coach Smith found a home this past fall here at Middleburg Academy. Having coached in the past, coach Smith was excited and “a little nervous,” heading into this fencing season. Now a varsity sport, both Coach Smith and Coach Tucker had to develop a varsity program with fencers who for the last three years were mostly self taught. Through their knowledge and enthusiasm, together they have expanded the skills of the fencing team exponentially in a short amount of time and are looking forward to many great years ahead. “They were both amazing! I don’t think we could’ve asked for anyone better to be our coaches,” said senior Alan Salacain. Last week Middleburg Academy held its first competition on campus facing a familiar foe, the Royal Swords Fencing Club, based out of Front Royal, VA. The event not only marked the first tournament held on campus, but also Senior Night, acknowledging two senior fencers for all their hard work over the last four years. Congratulations to Alan Salacain ’17 and Niketh Vellanki ’17 for all they have accomplished. Niketh took home 3rd place, while Alan finished 4th overall in their final fencing event. into regionals in their first year as a varsity sport is a great accomplishment. Middleburg Academy riders scored very well for being a team of five, where most of the other schools competing had over 15 riders. "As a senior, I am reflecting back to when I first arrived at Middleburg Academy in the fall of my freshman year, and there was no equestrian team," said Madison Busey. ~With a shared passion between me and two other students, as well as a very qualified and enthusiastic coach, we are able to bring a team 10 life. We may have started off with only three members, but throughout each year the team grew bigger and stronger." Physics goes outside for a hands-on lesson. A very normal matter at Middleburg Academy. An independent school established in 2009 and now serving grades 8-12, Middleburg Academy is on a mission to meet the needs of students living in a changing world. You may have heard of the acronym S.T.E.M., the latest buzzword in education and part of an initiative to bring science, technology, engineering and math to the forefront of student learning. "By 2020, 80 percent of jobs will be S.T.E.M. -related; said Colley Bell, the head of the school. "We want students to be nimble as they navigate through life, and that means preparing for a world that is constantly changing." The 'A' stands for the arts, which complete the package by wrapping creativity, critical thinking, communication, and collaboration into the benefits of S.T.E.M. "There are no noted collaborative elements in S.T.E.M., no arts, no humanities said, Colley. "To us, S.T.E.A.M. is about preparing kids for the real world by integrating hands-on-collaborations. Merely dropping a laptop in front of an Art teacher and calling it S.T.E.A.M. misses the essential point of what this is all about." Dragon Video attended the Inauguration to document people in the crowds. The promise of reinvention was exciting, and Colley met with students to discuss what could be done to prepare them better for higher education and beyond. Low college completion rates on a national scale forced the consideration of developing traits like cooperation, self-advocacy, pas­sion, grit and adaptability to ensure success in any environment. The main question became: How can students develop these traits while preparing for a world driven by technology? The answer came a year later, when Dave Gillis, the school's director of computer sci­ence and technology, brought in a program called Project Lead the Way (PLTW). This national curriculum was developed through a partnership between Johns Hopkins Univer­sity and engineering firms and folded seam­lessly into the school's computer science and engineering curriculums. Middleburg Academy is the only inde­pendent school in the region working with the PLTW program. "We're in our second year of S.T.E.A.M., and it's continually being built upon said Director of Advancement Edwina Bell. "Now PLTW is unfolding and evolving as well as our students take courses and discover their interests." Live Streaming at Middleburg Academy is where the school goes beyond the ordinary in program production. A game commentator is here at work in the Dragon's Nest. PLTW's problem-based learning model present students in computer science and engineering classes with hands-on activi­ties that build strong foundational skills in these areas. From there, students progress to choosing a creative group project aimed at making a difference in the computer science or engineering fields. The next step is a na­tional competition where teams present their project to a learning community made up of peers and judges. This national competition is the culmi­nation of, and undoubtedly the reward for, a year of collaboration, trial, discovery and problem-solving. On April 28, 2017, teams from Middleburg Academy hope to travel to the Kennedy Space Center in Florida to present their projects at the Conrad Spirit of ln.no­vation Challenge. The Conrad Challenge is a multi-phase competition that chal­lenges participants to develop solutions to real-world problems. Though S.T.E.A.M. is part of the school curriculum, the Conrad Challenge is vol­untary, which Dave Gillis says is by design. "When you volunteer for something. you're more committed," he said. "To me, this is a great opportunity for the students to step out of their curriculum and dream big." And dream big they do. Engineering stu­dents competing in the aerospace engineering category are working on developing a project that will aid in enhancing the transportation, navigation, and communication on Mars. Another group, motivated by the illness of the team leader's great-grandmother, designed a pair of augmented braces intended to speed up the recovery of those with leg infirmities. Both teams have spent the year coordinating schedules, avidly researching, experimenting, and consulting with their mentors and with each other to refine their ideas. Dragon Video live-streams and replays on the big screen in The Dungeon. Here, a Dragon is interviewed for the fans. Middleburg, VA - For the first time in Middleburg Academy history, fencing is now a varsity sport. A sport of grace, speed, and reflexes, fencing, also called Olympic fencing, is a sport in which two competitors fight using swords, with dull tips, winning points by making contact with their opponent. It takes people years to master such a craft, but luckily for the Middleburg fencing team our new varsity coach Rolando Tucker, knows all too well what it takes to be a world-class fencer. For three years Rolando was ranked first in the world for foil (a type of sword used in fencing) from 1995-1997. Named in “Cuba’s Top 10 Athletes” in 1994, he has won gold medals at National Tournaments, Central-American Games, Pan-Am Games, World Cups, and World Championships. A former Olympian, his team, took home the bronze medal at the Atlanta games in 1996. Middleburg Academy is an independent school serving grades 8 through 12, with small classes, dedicated faculty, full STEAM (Science, Technology, Engineering, Arts, and Math) curriculum, excellent athletics, and a remarkable record of graduates excelling at top universities. The campus in Middleburg, Va. is set on a 90-acre estate. More than 20% of the student body comes from abroad, and students benefit from an eight-to-one student to faculty ratio. There are 16 sports teams. For more information, visit www.middleburgacademy.org.